Screenshot from the Unity IDE. Although Mono has supported batch compilation from CIL into native code in the past there was a small amount of code that was still generated dynamically. The intention originally was to help reduce startup and increase code sharing across multiple processes. Code sharing is important once you have a handful of Mono processes running on the system. Instead of having to JIT the same code once per Mono instance for say "System.Console.WriteLine", the code laid out in essentially a shared object. Our generated code uses many of the concepts found on the ELF file format to ensure that we can share code and that the code pages are read-only and not written to. This means that methods are invoked through a program linkage table instead of directly (to cope with the shared libraries being loaded at different addresses). Although we are not certified XBox360 developers yet (we have yet to find the right person at Microsoft to talk to) we know from some of our users that have ported Mono to the XBox360 that JITing is not an option on that platform. The XBox360 seems to have the same security-imposed limitations that the iPhone has, it is not possible for a Just-in-Time compiler to run in the platform as either the license terms or the kernel do not allow writable pages to become executable pages. During the last few months we developed a static compilation mode for Mono. First we did this for the 1.0 profile, and now we are working on the 2.0 profile (so that we can support static compilation of generics). The work to support the 2.0 profile is reusing Mark's work on generic code sharing, which I found out to be a very nice synergy of efforts internally. This means that it is now possible compile code from CIL to native code and not even ship the JIT compiler in your final program (saving some precious kilobytes from the final executable). Use Mono 2.0.1 at least. Request that Mono performs a full AOT compilation by using: mono --aot=full program.exe. That will generate your static executable. This executable still needs the runtime for things like garbage collection, threading and other runtime services. Optionally: build a new Mono on a separate location that removes the JIT engine by configuring Mono like this: configure --enable-minimal=jit. This will reduce your deployment by a few hundred Ks as the code generation and JIT engines are stripped out. Optionally: build a smaller set of libraries by using the Mono Linker (this is the tool that we use for turning Mono's 3.5 APIs into the Silverlight 2.0 APIs). Optionally: strip out the CIL code from the assemblies. We still require the assemblies for their rich metadata, but the actual CIL instructions can be safely removed. The new cil-strip tool built on top of Mono.Cecil can further shrink your deployed executables. Developers interested in trimming down Mono can look into our documentation for more features that can be removed by using the --enable-minimal option. Of course, once you remove the JIT you will not be able to use any dynamically generated code. This means no Reflection.Emit dynamically and at least for the time being or no IronPython/IronRuby. John Lam told me at the PDC that they are looking into bringing static compilation for IronPython/IronRuby/DLR back, so this might just be a short-lived limitation. For those interested in using Mono on the iPhone today the situation is a bit painful right now. You must run Mono on the target system to do the batch compilation and send the data back to assembly it on the host before you send the code back to the iPhone to run. 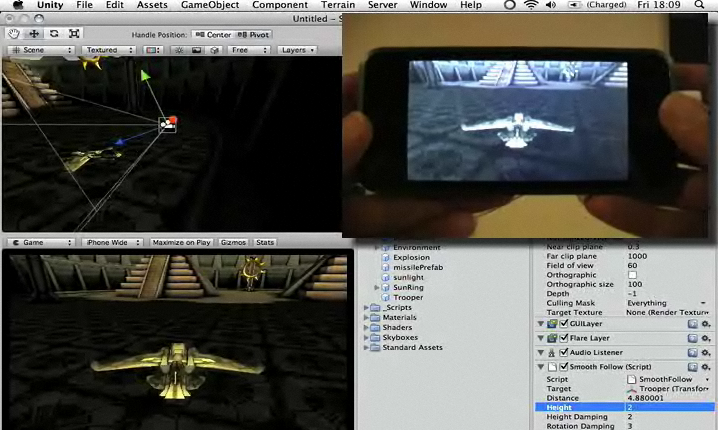 If you are wondering how did the demo go so smoothly at the PDC, the reason is that I was using Unity. Unity modified their local copy of Mono to be hardwired to do cross compilation to that exact platform. A more general purpose solution is needed to allow arbitrary platform-to-platform cross compilation, and we hope that this will be available in the future. If you must quench your thirst for C# on the iPhone today your best choice is to use Unity's product and start building games instead of the enterprise application you always dreamed of. If your boss demands that line of application running on the iPhone, you have a perfect excuse to learn the Unity gaming APIs and deliver the most glorious multi-touch, 3D-transformed line of business application to ever grace this world full with spinning AI for your "Sort By Customer Last Name" button.